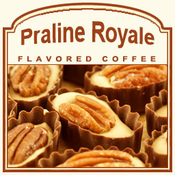 For a strong, sweet, praline-confection treat in your morning cup of coffee, look no further than the Praline Royale flavored coffee. This delicious collaboration of creamy, smooth milk chocolate mixed with sweet caramel will make your taste buds crave this delicious combination of flavors mixed with freshly roasted 100% Arabica gourmet coffee beans. 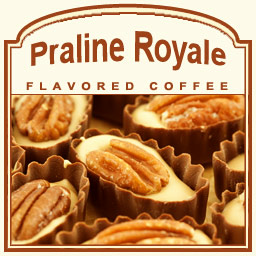 The fresh roasted Praline Royale will indulge your taste buds with a royally delicious treat morning or night, and with only 2 calories in each cup, you can feel like royalty with each and every sip. Roasted and shipped on the same day, the Praline Royale flavored coffee will hit the spot with its fresh flavor packaged in a heat-sealed valve bag. Perfect for those that have a sweet tooth, this confection-inspired flavored coffee will prove to be a luxury.